Original gouache for the related album n ° 2 it was realized by montage and collage of 2 originals authenticated by batet who signed it. Any new member or having less than 10 evaluations is asked to contact us before making his purchase under pain of cancellation of this one. Shipments are usually on Wednesday and the delivery time is therefore 5 to 6 working days. All our products are available in store in Paris 10th any question should be asked prior to purchase. Returns accepted, we thank you for contacting us before issuing a negative evaluation in order to find a respectful solution for both parties. 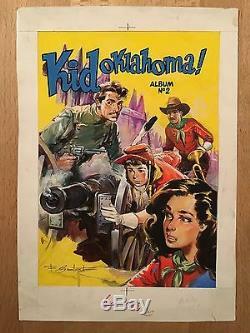 The item "kid oklahoma original cover batet tbe" is on sale since Wednesday 10 May 2017. It is in the category "books, comics, magazines \ bd \ boards, original drawings". The seller is "fantasmakbd" and is located in paris. This item can be shipped anywhere in the world.